Euan Dunn, RSPB’s Principal Marine Advisor and author of the new RSPB Spotlight: Puffins, looks at the effect of winter storms on Puffins. We have heard a great deal, and rightly so, about the massive impact that a seemingly endless conveyor belt of Atlantic storms had on the Somerset Levels and elsewhere on land. But the waves as tall as church towers that battered the coast were, beyond the scope of telephoto cameras, meanwhile wreaking havoc on seabirds out at sea. The scale of the damage inflicted, especially on Puffins, is only now becoming clear. Seabirds are well adapted to wintering far offshore but those that dive for their prey cannot cope when the surface waters are whipped metres deep into something resembling the spin cycle of a washing machine. Puffins are remarkable deep divers in pursuit of their prey, capable of plumbing depths to 70 metres, but they mostly fish in the top 10 metres where they are highly vulnerable to hurricane-force weather. The result has been mass starvation and mortality of seabirds along the Atlantic coats of France, the Channel and Wales. In a phenomenon known as a seabird ‘wreck’, around 30,000 seabirds had been washed ashore, dead or dying, and mostly emaciated, by the first week of March (http://www.bbc.co.uk/news/uk-england-26440087). It’s the tip of the iceberg as many more will have foundered at sea undetected. Over half (nearly 16,000) of the victims were Puffins, followed by Guillemots (nearly 9,000) and Razorbills (over 2,000). Casualties still alive were taken into care for rehabilitation but most have been beyond saving. These birds were in the throes of homing in on their breeding colonies so it remains to be seen what impact this, the biggest wreck of its kind in living memory, might have on numbers breeding in spring. Especially vulnerable could be very small, local Puffin populations including those on the Channel Islands, the Isles of Scilly, and Lundy in the Bristol Channel where the species is just beginning to repopulate after rats were eradicated from the island. Following hot on the heels of last year’s Puffin wreck in the North Sea which killed around 4,000 birds we know of, the fear is that increasing storm events associated with climate change will be a growing threat to our seabirds which are already under pressure. 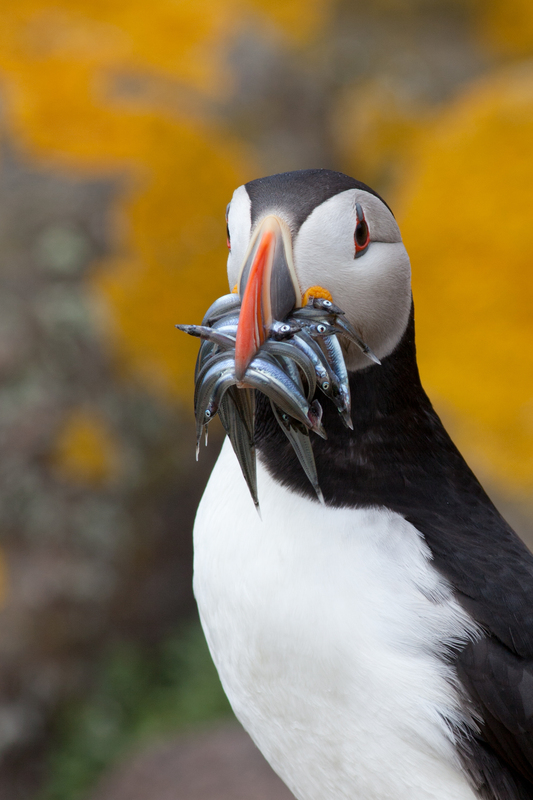 Their staple diet of sandeels (a small shoaling fish) is in decline in the North Sea, apparently linked to sea warming, which makes it harder for Puffins and other seabirds to find enough food for themselves and their chicks. Organisations like the RSPB can and do help seabirds on land by protecting their breeding sites and undertaking island restoration projects to rid them of rats and other predators. But the challenge at sea is how to make them more resilient to the devastating effects of such storms. One thing we can do to give them a fighting chance is to establish Marine Protected Areas (MPAs) such that critical feeding areas for Puffins and other seabirds are safeguarded. The UK’s network of MPAs is still more of string vest than a well woven wind-cheater and much remains to be done to bring it up to scratch. In the end, however, winter storms on the scale just witnessed are overwhelming and demand much greater political will to reverse the root cause of global warming.